As you read through this new entry, I ask that you consider the word “relationship”, always something that goes with something else. The more you relate things to one another, the more accurate you will be in learning to SEE. 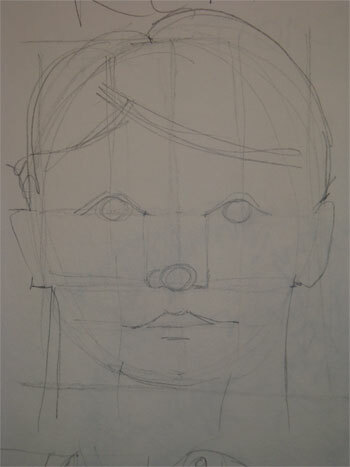 For example, draw a rectangle, this will contain the oval shape for the face. In relation to the top of the head, and the chin, where are the eyes, from the eyes to the chin, where is the nose, how about from the nose to the chin, where is the mouth, draw light lines to indicate those features. Now, between the side of the face and the center, where is the eyeball. As it is about halfway, I make a line to indicate that relationship. Interestingly enough, the corners of the mouth, in repose, relate to the center of the eyeball. The corners of the nose are directly under the inner aspect of the eyelid. The ears relate to the eyes and the nose. I use the negative shapes of the rectangle to help me determine the shape of the hair and the chin. NOw we are talking about a face in repose and staring straight on, things change when, the face is looking down, sideways or way up to the sky, so then there are a different set of relationships. 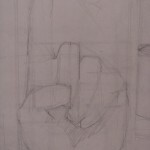 Everything you draw, should have an initial shape, then you can determine where its parts touch that shape and making a mark or a line will help you relate things to one another. 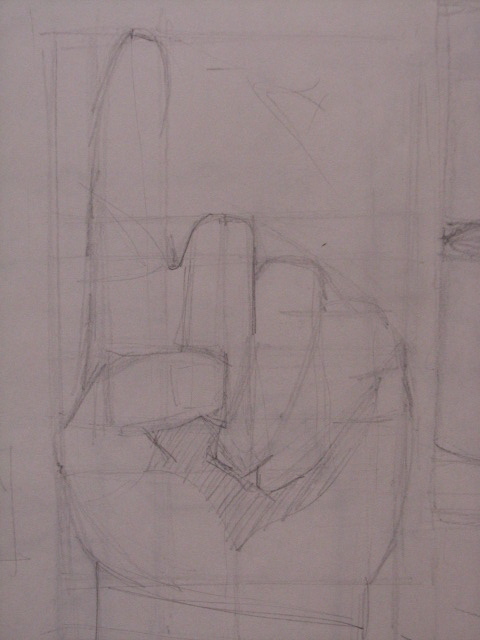 The face you see to the right shows the use of these initial shapes and lines, The one on the left is a little more refined, but using the same process and relationships. This method of drawing has been used by the masters, in fact, in some of daVince’s drawings, you can see evidence of giving his subject an initial shape and then dividing up the shape to have things relate to one another. 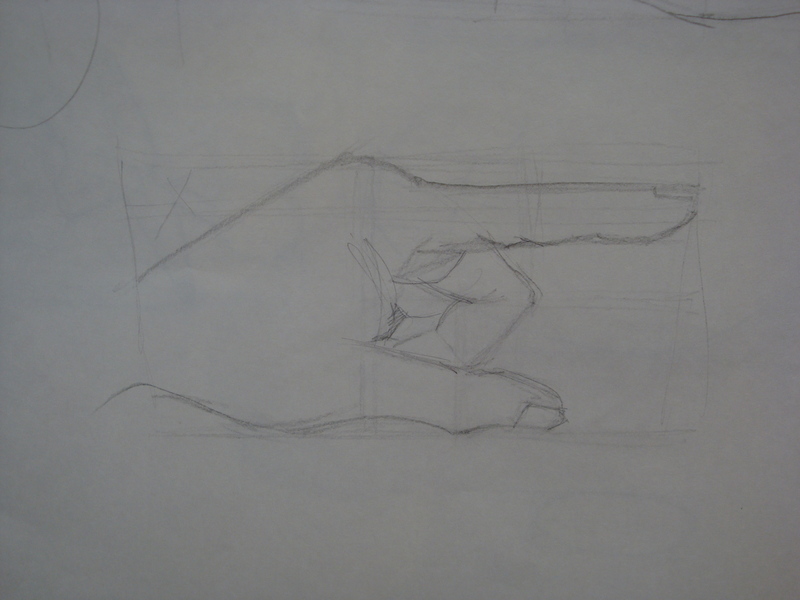 You always have your hand with you, put it in an interesting position and give it a shape, determine where each part of the hand touches the shape and draw a light line or mark to indicate that, use the negative spaces to show slants and knuckles, all of a sudden the hand will appear to you. 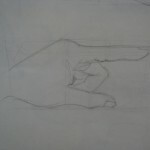 Try this, after you have the initial shape of your hand in an interesting position, use line to indicate where things are, use the negative shapes to show how much “volume” exists outside the hand and relate the the fingers to the palm, etc, don’t worry about the little lines and wrinkles in your hand, just the outside edges, and no shading. Remember, you are gradually going to learn to see again, gain confidence in this gift you have. Pretend that you are a babe and that you have never seen these things before, so that more than anything, you want to study them and document these new images. It is not that drawing is never a struggle, anything that you do, as you become more powerful and try more involved subjects, is daunting. But this is a process, the more you do it, the more proficient you become and then…the more you want to do it. 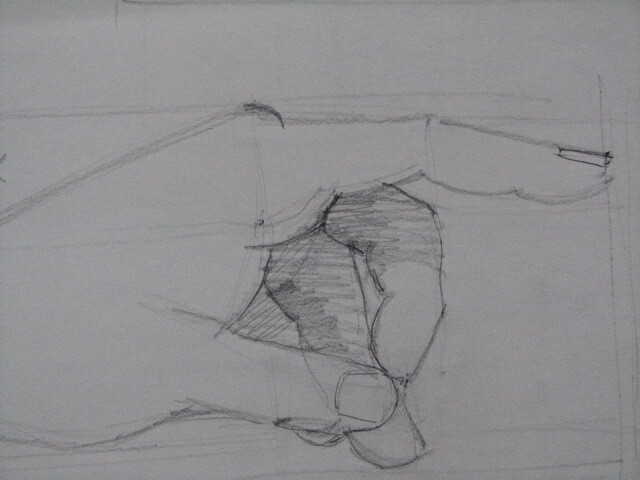 Above and beyond that, find something that you feel passion for, every pencil line is a caress. When I need a boost in the courage it takes to paint, all I have to do is read your blog and view your paintings!